The town of Bristol will pay a contractor $575,000 to replace a large culvert under Upper Round Pond Road with a bridge. The work will close the road for up to 60 days this summer. The Bristol Board of Selectmen accepted a $575,000 bid April 3 to replace a large culvert on Upper Round Pond Road. The bridge, near the intersection with Bristol Road, carries Upper Round Pond Road over the Pemaquid River. Hagar Enterprises Inc. of Damariscotta will replace the bridge. The work will close the road for up to 60 days this summer. The original bridge in the location was a stone structure, Keystone Bridge. The bridge was demolished in 1984 and replaced with a corrugated metal culvert, which has exceeded its 30-year lifespan and become corroded. The existing culvert is also not wide enough. The opening is only half the width of the river, while it should be 1.2 times the river’s width under state guidelines. Bristol Town Administrator Chris Hall described the future bridge as a steel arched span with stone cladding. A grant from a family foundation will cover the cost of the cladding. The selectmen’s vote followed negotiations with representatives of Calderwood Engineering and Hagar Enterprises Inc. regarding the bid for the project. The town agreed that it would not require a performance bond and would extend the maximum length of the bridge closure from 45 to 60 days, to lessen the chance of penalties for the contractor. Selectman Kristine Poland moved to accept the bid of $575,000. Selectman Paul Yates seconded the motion, and it carried, 3-0. The selectmen also discussed other capital projects, including the repair of the Bristol Mills Dam and the construction of a new fish ladder at the site. Hall reported that permits should be granted by the several regulatory agencies involved within a month or so. Possible delays were discussed and Hall asked the selectmen for permission to hold exploratory discussions with various contractors. 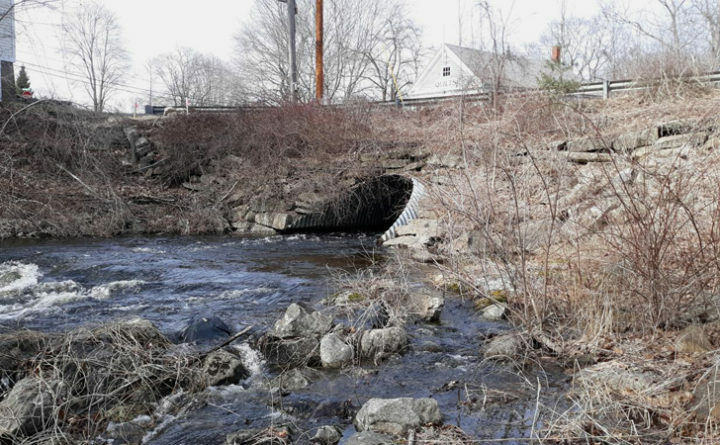 Selectman Chad Hanna said deferring the fish ladder to the 2020 season might be better than rushing into the job before the design and cost estimates are ready. The dam repair work could still proceed this year, subject to cost and funding. Hall will proceed with discussions with contractors. Other items discussed included the Bristol Consolidated School’s ballfield project. Nathan O. Northrup Forest Products & Earthwork will start clearing the land this month. The town’s road crew has begun clearing the land for the Munroe Bridge dry hydrant. Rusty Bryant will begin the excavation of the fire pond once the land is sufficiently dry. Poland and Hall reported on their meeting March 28 with Tidewater Telecom Inc. regarding its study of a build-out of fiber infrastructure in the town in coming years. Tidewater expects to present its plans to the selectmen in May. The selectmen approved a new lease for the gallery at Pemaquid Point Lighthouse Park with the Pemaquid Group of Artists. Also under parks matters, Hall reported that the parks and recreation commission has proposed to expand the scope of a window replacement project at Pemaquid Lighthouse Park due to a gift from the estate of Bette Zwicker of Bristol Mills. Contractor Neil Kimball is doing the work. The commission had planned to complete some of the windows in 2020. Hanna asked for details on the costs and the item was tabled until April 17. Jay Crooker and Rick Poland asked the selectmen to appoint the 2019-2020 fish committee, as they had five volunteers, including themselves, to serve on the committee. They said the start of the alewife run is not far off. The selectmen appointed Tyler Cheney, Crooker, Brent Fogg, Rick Poland, and Nathan Simmons to the committee.